In lesson 2 I forgot to mention one final step – creating a snapshot. At the end of every lesson, I suggest you create a snapshot of your virtual machine so that in case anything goes wrong, you can restore it. The reason I bring this up is because it happened to me while I was writing the last lesson. After I compiled gcc, my virtual machine died. It would boot and then black screen on me, so instead of fighting trying to fix it, I just restored my snapshot. I had to recompile the toolchain, but it was less time wasted than recreating the whole virtual machine had I not created that snapshot. addr2line: get the filename and line number for a given address in an object file. Used for debugging. ar: utility to create, modify or extract archives. Archives are typically used as code libraries. If you every see a file called libxxx.a, that is a library. It is a convenient way to store binary objects and link against them later. For example, say you were going to create a library for parsing serial input, you could compile it and archive it as libserial.a. Then when you want to use one of the functions from the library, link against it using -L <library directory> -lserial. A public header file is also required by the calling code, otherwise the library functions have to be extern’d. as: the assembler. Creates machine code (object files) from assembly. Called automatically by the compiler, but can be invoked manually on an assembly file. gcc: the compiler. Takes C code as an input and compiles it into machine code with the help of the C preprocessor and assembler. gcov/gprof: these two utilities typically go hand in hand. They stand for GNU coverage and GNU profiling. Used for analyzing and optimizing code. gdb: the GNU debugger. Command line only (GUI front-ends available). ld: the linker creates an executable from one or more object files. nm: lists the symbols in an object file. objdump: a utility to inspect the binary content of object files. This tool can be used to view the disassembled output of the compiled code. objcopy: this tool is used to copy and translate files from one format to another. The object file itself cannot be programmed to the target because it contains additional information that the machine itself cannot interpret. This tool is often used to convert object files to binary so they can be programmed to flash. ranlib is the same as ar, except it generates an index which speeds up linking. readelf: Displays the contents of an ELF file. An ELF file is a type of object file commonly used by gcc and other compilers. The ELF file contains headers which define the code structure, separating the compiled object into sections which represent different types of code. size: lists the section sizes in an object file. strings: prints the printable characters in a file. strip: strips symbols from an object file. Specific flags can be used to retain some symbols. In this lesson we will only be using gcc. When called on its own with default arguments, gcc actually invokes the C preprocessor, assembler and linker all in one. The output is an executable. By using additional flags, the compiler can be instructed to stop at any one of these steps. Before we jump into the code, we should spend a bit of time talking about editors. If you already have a preferred editor, you can probably skip to the next step. There are many options for editing code and I will point out a few of the most popular ones. I personally use vim – which is a command line based editor. I like it because it is fast and has all the features I need. I have customized my installed with additional programs, plugins and hot-keys so I can quickly navigate code. I will tell you now, vim is not for everyone. It takes some time to learn. If you are interested in using vim, I can provide you with my setup and configuration. Also, in the category of command line editors and a fierce competitor to vim is emacs. GUI front-ends exist for both vim and emacs. For simple text editors, gedit is quite popular and is the default text editor on some Ubuntu distros. It has an easy to use tabbed interface and it is lightweight. There are also plugins available which can add most IDE functionality. In the full-blown IDE category, the most popular is Eclipse. Eclipse is a Java based IDE which runs on Linux, Mac and Windows. It has all the features built right in and there are tons of additional plugins available. Because of the plugin support, Eclipse has become the go-to IDE for most semiconductor manufacturers to use as a foundation for their customized IDE environment. Texas Instruments’ Code Composer Studio and Freescale’s Code Warrior are prime examples. The downside to using an IDE like Eclipse is that it takes a lot of resources to run and in a virtual machine you may experience sluggishness. I would recommend increasing the amount of memory allocated to your virtual machine to at least 2GB. There are other popular IDEs such as Geany and Netbeans. If you do not yet have an IDE of choice, I suggest you try out a few of these and see which one speaks to you. The MSP430 launchpad comes with two microcontrollers, one of which is the MSP430G2553 (Note: [Bob] has informed me that the rev 1.3 and older Launchpads do not come with this device, so you will have to purchase it separately from TI if you have an older board). This is the device we will be using for our tutorials. If the alternate device is already installed, you must carefully remove it by prying slowly on each side with a screwdriver. If you pull it up from only one side, you will bend or break the pins. When installing the MSP430G2553 in the socket, the notch must be facing up towards the top of the device. The pins may also not align exactly (they may be too wide for the socket). In this case, place the chip on the socket so that one row of pins is just lightly seated in the socket. Gently push in the pins on the other side using the screwdriver until they line up and then push the chip down completely into the socket. Don’t try and force the chip into the socket. It is also important to keep electrostatic discharge (ESD / aka a shock) in mind when you are handling your Launchpad. Damage caused by ESD can leave you scratching your head because one second everything works and the next some part of it may not. Make sure to discharge any static electricity on something metal that is properly grounded before you touch the launchpad. Alternatively, you can buy an antistatic mat or wristband. There are two very important documents which you should read through and will be required as reference. The first is the MSP430x2xx Family User Guide which describes all the features that the family supports. A family is a set of chips that share a similar set of registers, memory map and peripherals. Each device may vary by the number of pins available and therefore may have more instances of some peripherals. Sometimes devices in the same family may be pin compatible – assuming they are the same package. There will also likely be differences in the amount of memory available. The second document is the MSP430G2x53/13 Datasheet. This document describes all the specifics of the device such as the exact sizes of memory, pin descriptions for the different packages and the electrical characteristics. Use the datasheet to find device specific information (such as which pin to use for I2c), and use family reference manual for functional descriptions. There is a lot of overlap between the two, so its best to cross-reference to have the best understanding of your device. Registers: extremely fast memory, built into the microcontroller. Used for configuration and operation of the device and peripherals. Registers maintain the context of the running code, such as the program counter, stack pointer etc.. Registers are volatile memory. RAM/SRAM: very fast memory which can be internal or external to the device. There are many types of RAM used for different purposes but there is always some built into the device (typically SRAM). Any variable that needs to be modified during execution will be placed in RAM because it is fast to read and write. Sometimes code is run from RAM depending on the amount in the device and specific implementation. Flash: There are many types of flash, some internal, others external using a variety of interfaces. Internal flash is where the program is stored. In the case of the MSP430, the code is executed from flash as well. This is called execute-in-place and is a feature of some types of flash. This means the code can be run directly from flash rather than copying to RAM/SRAM first. Flash is non-volatile, so the memory contents will be retained across a power cycle. Obviously this is required for storing the program. You cannot write flash directly. A flash controller is required to program the flash (there is one built into the MSP430). Also, flash must be erased in blocks called sectors before it can be programmed. When it is erased, all the bits are set to ‘1’. You can clear a bit to ‘0’, but you can not set a bit to ‘1’ without erasing the sector. It would be great if all the code could run in SRAM because it is extremely fast. But it is also very expensive, so using it as your desktop’s main memory instead of DDR would make it unaffordable. That’s why in the latest desktop processors, the L2 cache (which is SRAM) comes in 6MB or 8MB, orders of magnitude less than the amount of DDR RAM required. As technologies mature, we are seeing some very fast memory come down in price, while some of the emerging memory technology makes the current technology obsolete but at a very high price. Now that you understand what each of these are, let’s take a look at the memory map of the MSP430G2553. I will not go into detail about all the registers now because that would be pointless without using examples. We will instead learn about each one as required. The next section of memory starting at 200h is the RAM (SRAM), specifically in the case of the MSP430G2553. The arrows on the left indicate that the top of RAM and bottom of flash can vary for each device. The top of flash is fixed at FFFFh, which includes the interrupt vector table. We will discuss interrupt vectors in another lesson; for now think of it as a table of functions stored in flash that the hardware can call to notify the software of an event. The very top of flash starting at 10000h is for some devices which have an extended addressing scheme called MSP430X which enables addresses greater than 16 bits. The MSP430G2553 is not one of these, so for us flash boundary ends at FFFFh. If you take a look at the datasheet, table 8 shows the breakdown of the device specific memory organization. 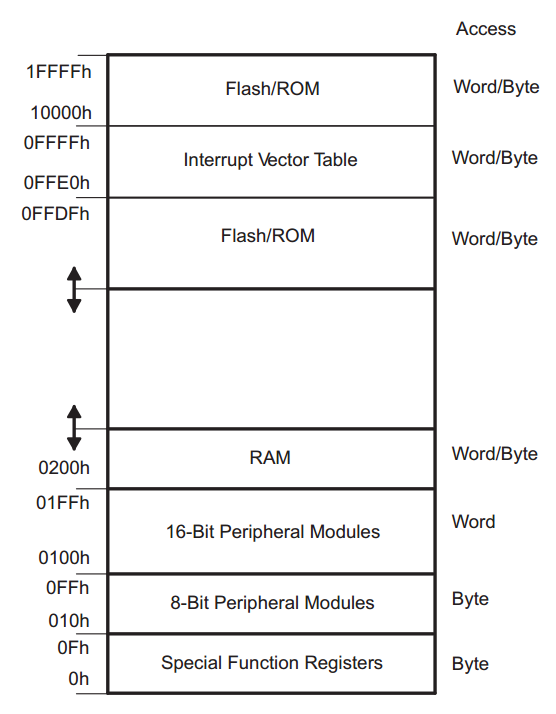 The MSP430G2553 has 16KB of flash and 512 bytes of RAM, so the RAM region ends at 3FFh and the flash starts at C000h. The information memory is a section of flash that is used to store device specific configuration parameters. We will use some of these in the next lesson to set up the clocking of the device. Once git is installed, you should set your username and email. This is used to track commits, so if you are working in a collaborative environment, you would be able to see who made what changes. Ok now we are ready to get the source code. The git repository is hosted on github. When you create a repository on github it is assigned a URL which can be used to obtain a copy of the repository using the git clone command. You should now see two files, README and main.c. Open up main.c in your editor of choice and navigate down past the file header comments. The first piece of code you will see is the include of msp430.h. This file is the generic header file for all the MSP430 devices. If you look at msp430.h, which is located in /opt/msp430-toolchain/msp430-none-elf/include, you can see that the file uses hash defines to determine which device specific header file to include. This is useful because it offers the flexibility of compiling the same code for a different device by changing only the compile flag (details are in the next step). The device specific header file defines all the registers, their offsets and bitfield definitions. To see what is available for this device, take a look at ./msp430-none-elf/include/msp430g2553.h. Throughout the tutorials I will be referencing this contents of this file as we use them in the code. The first example using the definitions in this header file is the first line of code in the main function (back in main.c). The MSP430 has a watchdog timer, which is basically hardware clock that can reset the board if it is not ‘pet’ periodically. Petting the watchdog typically means writing some value into a register. We will talk about the watchdog, how to configure it, and how it is used in a later lesson. For now it will be held back – or disabled – so the device doesn’t constantly reset. To do so we use the watchdog control register, defined as WDTCTL in msp430g2553.h, and set the appropriate bits, WDTPW – the watchdog password – and WDTHOLD – the bit to hold the watchdog. Note that the register and bit names in the header file match those in the family reference manual. In order to illuminate LED1 on the board, we need to know which pin it is connected to. Luckily, TI has provided that information directly on the board, so no schematic surfing required just yet. If you are are unfamiliar with bitwise operations in C, you should stop now and learn them. This code sets bit 0 of the P1DIR register which configures pin P1.0 as an output. Why bit 0 you ask? Because the pin number within the port is directly correlated to the bit in the each of the pin configuration registers. This applies to all the pin configuration registers for all ports. Therefore, the output of the pin can be set to either high or low using the P1OUT register by setting or clearing bit 0 respectively. This is by no means a complete explanation of the pin configuration for the MSP430. There is much more functionality which will be explained in depth in the next lesson. For now, this will be sufficient to turn on the LED. To make the LED blink we can toggle the pin output using the following code. This infinite while loop uses the __delay_cycles function to wait 200000 cycles between each LED toggle. This function is an intrinsic gcc function, meaning that it is built in the compiler. To toggle the LED output, the exclusive-or operator is used. Finally let us compile and run the code! Start by using the following command to compile using gcc. The the ‘mmcu’ flag tells the compiler which microcontroller to compile for. When compiled with –mmcu=msp430g2553, the compiler will, amongst other things, define __MSP430G2553__ (i. e. #define __MSP430G2553__ in code) . Recall from the previous section, this define is used to determine which header file should be used. Once the code is compiled, there will be a new file called a.out. The name of the file ‘a.out’ is the default gcc output filename if one is not specified. Next the file can be downloaded to the target. There are a few tools which can be used to download the code to the target. The first is gdb, which is the standard in the open source community for debugging. GDB can run standalone if you are debugging on your host machine. However, if you are debugging on a target, there needs to be an additional interface available. This is sometimes implemented as a utility called gdbserver, which creates a TCP/IP connection that gdb can connect to. Manufacturers of some JTAG (diagnostics interface) tools make their own gdbserver for their tools. GDB is extremely powerful and very mature, but can be a bit difficult to set up and learn. For this reason, I will start off with the second option, mspdebug. This utility is an open source project created specifically for programming and debugging the MSP430s. It is very simple to use and is available for download in the Ubuntu repositories, so let’s install this utility. 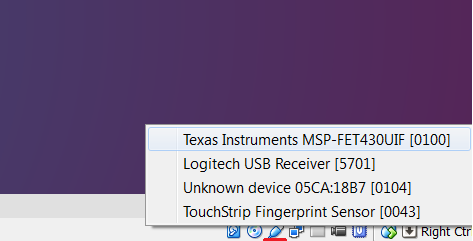 Now, connect the USB cable to the MSP430 Launchpad and to your computer. Your host machine may or may not recognize the interface, but either way it should be available to attach to your virtual machine (NOTE: [Bob] has brought to my attention that if you are running a Linux host, you must add yourself to the vboxusers group in order to access USB devices in VirtualBox, instructions are available here). You should see the program connecting to the device. Once it is connected, program a.out to the device. Each section of code has been written to the device flash (remember from above flash is from C000h to FFFFh). Now you can run the program by typing ‘run’ into mspdebug. The red LED on the board will start flashing. To stop the program use CTRL-C. To reset the board, use the ‘reset’ command. And that’s all for today. Don’t forget to take a snapshot of your vm. In the next lesson we will build on this code to learn how to configure the clocks and pins of the MSP430. All steps are very well explained. Best regards! This did not work for me. I’m using OSX Mavericks. When I try to access this from the VirtualBox by clicking on the usb logo on the bottom right of the window, it appears as one of the selections but it is not clickable. Another member has the same problem with OSX as well. Have you looked at this site http://processors.wiki.ti.com/index.php/MSP430_LaunchPad_Mac_OS_X? At the bottom of the page they mention a USB driver for evaluation. You can also check out the TI E2E forums for the MSP430. Note I still do not have access to the serial port in Lubuntu after following these instructions. I agree with Joel, thanks Chris!! I have progressed to Lesson 3 OK. After git status I see we have a README and a main.c file. It’s probably a stupid question but how do I open main.c in my editor of choice? I haven’t used Eclipse in a while, but there is an option to make a new project using an existing makefile. I believe it is called “Makefile project with existing code” under the C/C++ projects. Then you will have to modify the compiler and debugging settings to point to the msp430 gcc. This link is for the CCS wiki. It won’t be exactly the same but it should help you with some of the options you will need to configure. Hi, thanks for these tutorials. I have tried vim under Windows a couple of time but always run in to issues with code completion. So this could be a great opportunity to start using it. I would appreciate it if you could share your setup with me. I’m baffled by this, but at least I know how to work around it. Any ideas why some linker script files are found by default and some aren’t? I appears it’s looking for the right filename, but possibly in a different (wrong) default directory. Am I missing something or is this a msp430-gcc bug? Hi Lou. That’s an interesting find. It seems to be a compiler bug. If you pass gcc the -v option, you can see which options are being passed to the linker and it looks like the defaults are not including the correct directories when using the mmcu switch for that device. I can reproduce this on my end and if you use the MSP430G2553 they are as expected, but with the MSP430FR5969, they are not. Are you using the latest compiler? If so it should be reported to TI on the E2E forums. Hi Khoa. Which version of msp430-gcc are you using? Did you compile it from source as per the instructions in the previous tutorial? Can you make sure that you successfully copied the header and linker files to the correct location in the toolchain root directory. If you go in /opt/msp430-toolchain and run the command ‘find . -name msp430.h’, what do you get? If it finds the file, could you please show me the permissions set for the file (ls -al). Cheers. Great tutorial, all steps and tools are well explained at the right depth. Thank you for taking your time in doing these tutorials, I am sure going to enjoy them. Thanks Jesus! Glad to hear you are finding them helpful. Cheers! Very useful information and great tutorial, all well explained, thanks Chris! Thanks for the great feedback Raul! Such an incredible article. Congrats on your great work. I’m using the latest versions of the source files and support files. I’m stuck! Please help! main.c:1:0: warning: devices.csv not found on any include paths. I copied the devices.csv file into the /opt/msp430-toolchain/msp430-none-elf/include/ and ran the command below. looks like it’s having a hard time finding gcc files??? It seems like there is a config issue going on… any help would be greatly appreciated.